Tails for all! is one of my all time favourite half-bakery suggestions. The benefits are immediately recognisable – an extra prehensile limb, another facet of emotional expression or a decorative tail of choice – and yet the idea seems so completely unobtainable. However, biomechanics and robotic body augmentation have begun to be explored – first in medicine and military uses and then by artists. Quite a few artists have played with the addition of animal traits through mechanical devices. I particularly like the work of Paul Granjon. I saw Paul talk about some of his projects at last year’s (re)actor2 festival hosted at Leeds Met. 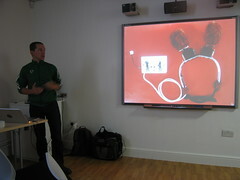 His talk, ‘Performing with machines and performing machines’ showed projects like Sexed Robots and Robotic Ears. Sexed Robots raises interesting ideas about robots bound to the nature of their human creators, but that’s a whole other post. Robotic Ears is an intriguing example of a robotic body extension. Like Tails for All, the addition feels like it makes sense, and yet the ears have no functional utility, as such, beyond their performability. Paul performed using a number of his machines later in the conference – what he calls ‘human-machine live performance’ – as part of a caberet evening in the Gatecrasher club. The ears featured alongside live lo-fi digital music, self-destroying devices and percussive mechanical sculptures. Bringing this train of thought full circle, the ears were worn with a robotic tail while Paul performed the Animal song (mp3).